So, you’ve decided to attend a track day, and you’re excited to see what your car (and you) can do on the circuit. There’s a lot to learn—it can be a bit bewildering—and you may have some questions. What should you expect at a track day? What is expected of you? Where can you find the best track day tips? This definitive guide is for you drivers who have limited or no experience and want to learn how to organise and plan a track day, as well as the rules and regulations of the event, how to prepare your car, and some track driving techniques. This guide may also be used by intermediate track day drivers who want to learn something new, or confirm that they’re heading in the right direction with their circuit driving. The Driver 61 staff—including myself—have attended hundreds and hundreds of driving events and with all of our combined experience, we want to pass on our knowledge to you. Simply click on the section title to jump to it. Learn the fundamental techniques you’ll need on track to become faster, safer and more consistent. Learn the secrets of Professional drivers with Driver 61’s Driver’s University. Once you’ve decided to go ahead and get out on circuit, the first thing to do is find a track day organiser with whom to book the day. I have been a customer, and also have coached on hundreds of track days around the UK and Europe, and I highly recommend BookaTrack and RMA Track Days as fantastic providers. Both organisers run excellent days with a strong focus on safety, not to mention the fantastic circuits they visit. The BookaTrack calendar (below) is great for checking out their available dates; note the important details of circuit type, session type and maximum noise limit. We are extremely lucky in the UK to be surrounded by a host of famous and classic circuits that are genuinely some of the best in the world. If you’re a beginner, it’s important to choose a circuit that has a lot of “run-off”—if you’re unfamiliar with the term “run-off,” it is the amount of safety area (asphalt or gravel) surrounding a corner. If you make a mistake, you can spin into these zones in relative safety, which can save you and your car from damage. Some of the safest circuits, with the largest “run-off” areas, are Silverstone, Donington Park, and Snetterton. On the other hand, I’d stay away from Cadwell Park and Oulton Park until you’re more experienced, as they’re technical, fast, and have almost no run-off. Silvertone Circuit has plenty of run off area. Race and track day cars are noisy—that’s one of the reasons we love them so much. However, residents who move to homes near race circuits don’t seem to have the same passion—nor the foresight—to understand that moving near a race circuit may sometimes be noisy—and a few of them try their hardest to stop our fun. Therefore, noise limits are extremely important to circuits and track day organisers. Some circuits now have noise monitors that are linked directly to local council offices and if there’s a breach of the limit, they get informed in real time. If your car is over the track’s noise limit, you’ll get one opportunity to fix the problem properly with a substantial physical change, and if you don’t, you won’t be allowed back out on track. It’s a harsh, but necessary rule if we want to continue driving on track days. It make more sense to be aware of the noise limit set for the day and have your car tested before arriving at the circuit. Getting your own Noise Level Meter is a very smart investment if it saves you from wasting an entire day of track time. All of the track day organisers’ calendars will explain what the noise limit is for the day and how it is measured. It’s your job to make sure you’re below this limit. If you don’t know how loud your car will be, speak to the organiser—they will likely have hosted a similar car previously and will let you know if they expect an issue. There are two typical formats to track days depending on the organiser and the event. Open pitlane track days leave the pitlane open to all cars for the entire day—apart from lunchtime. On the plus side, you can go out on the circuit whenever you please. On the downside, you may be mixed with drivers and cars that aren’t lapping at a speed similar to yours and so overtaking/being overtaken may occur frequently. Sessioned track days do exactly what they say: cars and drivers are categorised into groups by speed or experience, and they lap around the circuit in separate sessions. Note that the groups are formed by drivers’ opinion of their speed, so please be honest when explaining your driving level. Cars and drivers are usually split into three groups with sessions that typically last 20 minutes, so you’ll get one session per hour. This means you’ll be surrounded by cars driving at similar speeds and shouldn’t be overtaking/overtaken constantly. Both formats have their pros and cons, but most people prefer open pit lanes and many organisers format their days this way. The organiser’s track day calendar will always explain in which format the day is. The cost of track days varies between organisers, but as with most things, you get what you pay for. You can expect to pay between £120 to £500, with the main difference in price coming from circuit hire costs and how many cars are booked for that track day: the fewer cars, the more expensive your spot will be. Personally, I’d prefer to have fewer cars on the track and am happy to pay the extra money. When there are too many cars on track, there’s heavy traffic and you never get a free lap which becomes frustrating. As I’ve mentioned, I can personally recommend BookaTrack and RMA as track day organisers who seem to have found a good price balance—relatively quiet days at a reasonable price. Track days are not just for road cars. Surprisingly, race cars are allowed as well. Many times, I’ve seen drivers in their road-car hot hatches on track at the same time as a pro-driver in his Ferrari 458 Challenge racing car. In fact, I’ve also been in both. As you can imagine, speed differences can be huge, but these are track days, not racing test days. Any drivers who are misbehaving and should know better are usually dealt with quickly and firmly, so there’s no reason to be concerned if you see racecars on your track day. You can expect an interesting and varied array of cars on a track day. Driving you pride and joy around a circuit will be fantastic fun—however, as I’ve mentioned already, accidents on track can happen. Track day insurance can give you some peace of mind. Use Your Car or Hire? Taking your own car on track on track has its own merits, but perhaps you don’t want to wear out your own tyres, brakes, and engine, and take the risk of damage. It seems that because people drive cars on the road every day, they think driving on a circuit shouldn’t be much different. Put simply, this is absolutely not the case! Even if you feel you are a good driver on the road, please respect the racing circuit. This is motorsport and motorsport is dangerous. If you want to be as safe as possible and decrease your learning curve tremendously, I highly recommend instruction from a professional. In fact, I feel so strongly about this that if I organized track days, I would make it compulsory for first-time drivers. All track day organisers offer inexpensive instruction at their events—it’ll cost you around £50 for a 30-minute session—but could save you thousands in accident damage. Even if you’ve been on many track days, I would advise instruction every now and then—a good coach will make you faster, safer, and more consistent, and will keep you from forming any bad habits. To give you as much advice as possible, there is a whole section later in this document dedicated to driving technique. There are also other track day driving articles on our blog. With a huge mix of talent in variously powered and gripped cars on track days, overtaking—and being overtaken—can be difficult. Thankfully, overtaking rules among the track day organisers are simple and for the most part, similar. Firstly, there must be no overtaking in the more risky areas of braking and cornering. Therefore, overtaking must only take place on the straights, where there is much less chance of a car spinning or going off the circuit. “Lunging” another car into a corner at the last second will usually result in a visit from the Chief Instructor and a warning, with a second incident likely ending up in an early bath. This may sound a little harsh, but safety is the priority here. The second rule, which is in use with every track day organiser I know, apart from RMA Track Days, is that you must overtake on a given side. Most commonly, you must overtake on the left-hand side. This rule makes sense, as it ensures minimal opportunity for misunderstanding when overtaking occurs. If you have a faster car behind, make sure that you move your vehicle to one side (usually the right) gently yet obviously—do not just sit in the middle of the circuit. You should also indicate to which side you’re moving. If you’re in a powerful car that may not be so fast in the corners, you may have to lift on the straight to let the faster (on an overall lap) passed. When you’re overtaking, make sure you’re fully past the other car before you reach the next braking zone. This is important, as if you’re only alongside or halfway along the car you’re overtaking, they may not have seen you. Then there is the possibility that they might turn across you into the next corner, resulting in unwanted contact. Track days use the same flag or light systems as you see on TV with F1 and you are expected to respect them in the same manner. Sometimes, it can be hard to spot a circuit flag—especially when you’re so focused on driving—but you must be observant, as flags are the only way officials and marshals can communicate with you whilst on circuit. Yellow flag: There’s danger ahead—maybe a car has spun out or broken down. Slow down, be prepared to drive around a stranded car, and do not overtake until you pass the next marshal’s post or green flag. Yellow and red striped flag: There’s debris or fluid on the circuit. Be prepared to avoid debris or to experience a reduction in grip. Blue flag: This means another, faster car wants to overtake you. Stay on your racing line or, if on a straight, stay to one side (usually defined by the track day organiser) so the faster car can overtake. Red flag: There’s been a serious incident, and the session is being stopped. Reduce speed, do not overtake, and return to the pits at the next opportunity. Black flag: Your car has a problem that you may not be able to see, or there is an issue with your driving standards. Slow down, return to the pitlane, and report to a track day official. Chequered flag: The end of the session – complete the lap at a reduced speed and return to the pits. You will only see the chequered flag at lunch time and the end of the day on a track day. If you can find someone brave enough to sit next to you on a track day, they can. They’ll have to be over 16 years old and wear the same equipment as you (helmet and limbs covered). They’ll also need to sign a waiver and possibly pay a small additional fee. You’ll be told in your track day briefing, but you should never stop on the circuit! If you have an issue with your car or yourself, pit at the earliest opportunity and sort the problem out there. Stopping on the circuit will cause a red flag and if an unnecessary stoppage occurs, your fellow drivers will not be happy. 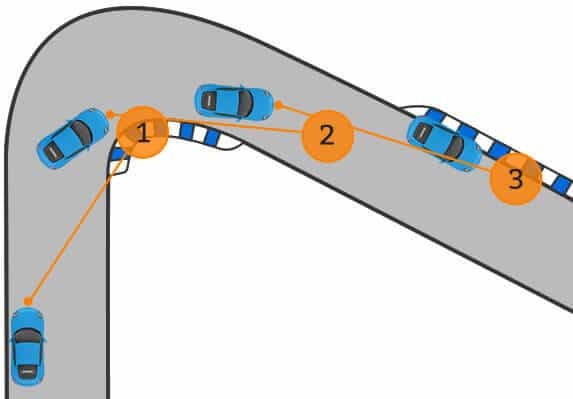 However, if your car breaks down or you have an “incident” and cannot continue to the pits, try to stop the car as close to the barrier as possible, or even better, next to a gap in the barrier which will be indicated in some way – usually a hatching or an orange stripe. This is best for safety and marshals can also recover your car efficiently. If it’s safe to do so, get out of the car and move behind the barrier, unless told otherwise by a marshal. If you have to stop on circuit, try to stop near a gap in the barrier. When taking part in a track day event, it is not necessary to have the complete racing driver’s kit, although I would advise it. The bare minimum kit you need is a helmet and to have your whole body covered in clothing—jeans and a jumper will do just fine. If you don’t have a helmet, you can usually hire one from the track day organiser at a reasonable cost—but please check with them first. If you have the cash, the first equipment I recommend buying is a helmet. When it’s yours, you know it has been well looked after and can protect your head properly. A good helmet does not come cheap, with prices reaching £2500 +VAT for a carbon Arai. However, it’s possible to get a decent lid for about £350. Take a look at our Helmet Buyer’s Guide and this article on recommended helmets for track days. A well-fitting helmet is a must for obvious reasons, so be sure, even if you hire one, that it fits snuggly. The crown of your head should fit well in the helmet, with your cheeks squashed slightly by the cheek pads. To check the helmet is a good fit, put it on and fasten. Then grab the chin piece and pull to the side—if the helmet rotates a lot, it is too big. Also try pushing two fingers up the back of the helmet from the base if your neck, if this is easily done the helmet is again too large. If you have the cash, the next equipment to buy is a good pair of racing boots as you want as much feel on the pedals as possible and thin soled boots allow this. An entry-level pair of boots will set you back around £100. If you’re on a limited budget, just use shoes or trainers that have a really thin sole—running shoes with a thick sole will really make things difficult. You can pick up a pair of gym pumps at Decathlon for a couple of quid which will do the job well, as long as you don’t mind being laughed at by your driving mates. Finally, and if you’re willing to make then investment, I recommend that you buy gloves and overalls. Gloves will help you grip your steering wheel, especially when the adrenaline is flowing and you’re sweating buckets. A decent pair of gloves costs around £50, which is well worth the money. From a safety perspective, fire-retardant overalls can be important—you can pick up a good entry-level pair for just over £300. For more information on the best gear to take to a track day, look at our latest article here..
As well as preparing yourself, it’s very important to prepare your car for a track day. Even though your car doesn’t require an MOT, or even road registration, it’ll require some checks and maintenance if you want it to last the entire day. Your car’s tyres are the only point of contact with the race circuit; therefore, it is extremely important that you take care of them and prepare them properly. The first thing to do is ensure that the wheels are balanced. If you have any vibration or feedback when you are driving on the road, it will be much worse on a track. Next, make a visual inspection of the tyres. Make sure they have enough tread to last the day and that the tread and sidewalls are in good condition; you should be looking for cracks or tears that may be troublesome once you’re driving quickly. If you have the budget, it’s a good idea to have a second set of track day wheels and tyres that you can exchange once you get to the circuit. This means you can prevent damaging your road wheels, and have more suitable track day rubber. Before you head out on the track for the first time, check the torque of all the wheel nuts and make sure you continue to do so throughout the day, as they can become loose while lapping. Finding the correct tyre pressures is important when tracking your car—when you drive around the circuit continuously, your tyres will get warm and their pressure will rise. Therefore, you must set your tyre pressures when “hot.” My advice is to do one session to get the tyres warm, and then check carefully to see how the tread is scuffed. If the sidewall is becoming scuffed, increase the pressure as you need to make the tyre stiffer. On the other hand, if only the center of the tread is scuffed—and it doesn’t cover the whole tread—reduce the pressure. Make sure you check your tyres after each and every session. It is most likely that you will have to reduce tyre pressure after the first session from usual road levels. At the end of the day, remember to check your tyre pressures again, once they’ve cooled down—it’s likely that you’ll have to increase the pressure once more before you head home. It’s also a good idea to check the wear and condition of the tyres at the end of the day to make sure you’re legal. The legal limit for tyre tread is a depth of 1.6 millimetres across the central three-quarters of tread. Take a look at our recommendations for track day tyres here, and take a look at our tyre pressure gauges here. Brakes are often the Achilles heel of road cars used on track days. You may think that you brake hard on the road, but this will be nothing compared to the continual heavy braking you’ll do on track. The first thing to do is to keep your sessions short—this will reduce the brake temperature that builds up over many laps. I recommend keeping your sessions to around 15 minutes each; you’re not driving at the 24 Hours of Le Mans, and this will be enough driving time for you and your car. Once you’ve completed your 15 minutes or so of track time, make sure you do one lap of brake cooling. The idea here is to get airflow over the brakes, without using them heavily, which will allow them to cool more slowly and prevent the discs from warping or cracking. In between sessions, make sure you do not use the handbrake. The handbrake clamps around the rear discs and if used when the discs are hot, can damage them. It’s unlikely you’ll have glowing carbon discs on your track day toy, but they do make for a great picture! If you’re using new brakes and / or discs on a track day, take a look at this guide to correctly bed in your new brakes. A track day will subject your engine to more stress than your usual dash to work, so it’s important to do a few checks before you head out. Ensure that the engine oil is in good condition and filled to the maximum mark—your car will be cornering faster than ever before and oil surge is possible if the level is low. If the oil is old, have it flushed and changed. Remember to take some spare oil to the track day itself, so you can top up if necessary. Before you head out onto the circuit, you must bring your engine up to temperature. Depending on the ambient temperature, simply start your car five to 10 minutes before you want to go out and ensure that the water temperature is over around 50°C. During the day, keep a very close eye on water and/or oil temperature—if the engine overheats, an alarm will usually appear. If you have an older car, you may not have an alarm so keep the water temperature below 90°C and the oil below 110°C. As with cooling the brakes, I advise reducing the engine’s RPMs on your in-lap to give it some opportunity to cool before you finish your session—it’s the same idea of getting as much air through the radiators with as little stress (RPMs) as possible. Now that you’ve taken care of the wheels, brakes, and engine, there are just a few more things to think about before you can enjoy your day. Make sure you remove any loose items inside the car—they will likely become dislodged when driving on track and could possibly get caught under a pedal, which is obviously not what you want. Check your lights and indicators throughout the day. It’s important that they’re working whilst you’re on track, in case you need to move out of the way for a faster car. Also, check your mirrors before you head out; it’s poor track day etiquette if you do not see a faster car behind and slow them down for a number of corners. Be sure you check your fuel at regular intervals—you’ll be amazed at how quickly you’ll get through it. Many circuits have a fuel station on site—which usually costs a fortune—however the organisers will usually tell you where the closest (cheaper) fuel station is in the morning’s briefing. It’s advisable to take some tools on your track day, as you don’t want a small problem to stop your running for the day. The first thing you’ll need to get right—before you even think about hitting your first apex—is your position in the driver’s seat. You should have the seat one or two notches closer to the pedals than usual so that you can depress the clutch fully while your leg is bent slightly. You also need to have your body a little closer to the steering wheel than usual. You can change this by making your seat more upright or, if it’s adjustable, by bringing the wheel itself closer to you. Either is fine, but make sure that when you rotate the steering wheel by 90 degrees, you still have a decent bend in your arm. If your arm is straight and it feels like a bit of a stretch, you need to be closer to the steering wheel. First, move your seat a notch or two closer to the pedals. 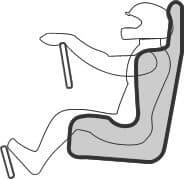 Then adjust the seat back or steering wheel until you can rest your wrists comfortably on top of the wheel. When you’re in position your seat should be more upright than usual and you should have a bend in your arm, even when the steering wheel is at 90 degrees. Over the years, I have met few track day drivers who hold the steering wheel correctly from their first lap. I’ve met many more who still hold it incorrectly, even after years of driving. You must hold the steering wheel at a quarter-to-three position—horizontally across the wheel. Luckily, the steering wheel is usually moulded ergonomically to fit with your hands in this position. Your hands should never move from this position. There should be no shuffling of the wheel…we’re on a race circuit, not in a car park. Make sure your thumbs are around the wheel, so that you’re gripping it well which gives you the best stability. This is unlike how the police drive, with their thumbs on top of the wheel—this is not correct on the circuit. When you keep your hands in the same position on the steering wheel and don’t shuffle, you have a much stronger grip and can react to a slide much more quickly. It also allows you to be smoother and more fluid with your steering inputs, which is the correct way to drive on track. 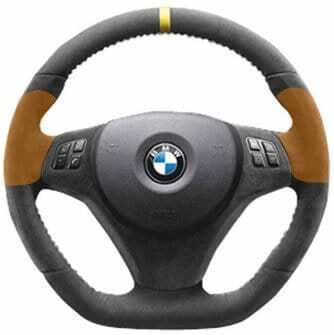 Your hands should grip around the steering wheel as shown by the orange sections in the image, with your thumbs inside the rim. You should keep your hands in this position and do not shuffle the wheel. As I mentioned at the beginning of this article, driving on a track day is completely different from driving on the road. You must leave your ego at home—you’re not going to break any lap records on your first day; instead, use it to learn as much as possible. If you can afford the £50 (or around £350 for a full day), have an instructor sit next to you for your first laps—they will ensure your safety and set you off in the right direction. For your first laps, I’d advise waiting 20 minutes or so after the circuit goes live in the morning. This allows the rush to calm down a little and there will be fewer cars on the circuit. Take the first few laps very slowly. Learn where the circuit goes and watch your mirrors. There’s an incredible amount to think about, and we all have a learning capacity—which is easily reached on track. Learning to drive a car on track whilst learning a circuit, and watching out for faster, and perhaps slower cars, is just plain difficult. So, start your day steadily and build as you learn how your car behaves at speed and every inch of that track. I’d advise keeping session lengths (even if you’re experienced) to 15 minutes. Over the many years I’ve been coaching, it’s obvious that most amateur driver’s concentration falls off dramatically at around 15 or 20 minutes and then the silly mistakes happen, like the accident you have while driving just “one more lap”! As long as you don’t have to think consciously about your inputs to the pedals, steering, and gear changes, the most important thing to think about with respect to driving technique is vision – you can see a detailed tutorial here. Sounds simple, doesn’t it? Yet I can say that 100% of new drivers I’ve worked with had poor vision on track in their first few days. I’m not saying they can’t see—they just don’t give themselves the best opportunity to drive well, because where they are looking is too close and too focused with respect to where they currently are. When you’re driving on a track, you’ll be going faster than you would on the road. Therefore, you’ll arrive at corners faster and must move your vision substantially further ahead than you would naturally. There are five phases to a corner: approach, braking, turn-in, apex, and exit. Your vision should always be one step ahead of where your car is. For example, when you’re braking, you must already be looking at the apex (the clipping point for the best racing line on the inside of the corner). This gives you more time to judge the speed and turning point for the curve. Once you’re at the apex, it’s then time to look up and ahead for the exit, so you can judge when to get on the throttle and how to take the best racing line. While in the braking zone, look towards the apex so you can gauge speed and turning. At the apex, look out towards the exit of the corner. Once you’ve passed the apex, look for the exit and beyond. If you’ve ever watched any motorsport on TV, you’ll know what a racing line looks like—professional drivers make it look easy as they glide their cars from the outside to the inside and back to the outside of the course. However, when you’re on the circuit yourself, carving out a smooth and fast line is much more difficult and only comes with experience and seat time. The diagram below shows an overly simple corner, but for the purposes of explanation, it’s perfect. The idea is to drive the corner with an arc as open as possible—therefore allowing you to carry as much speed as possible. The right-hand hairpin corner shown should be approached as far to the left-hand side of the track as possible before turning the car and aiming for the apex on the inside of the corner. You should then release the steering as you allow the car to push out to the left-hand side of the course again. As well as the racing line, it explains the various stages of the corner: braking, easing off the brakes, transitioning to the throttle, part/balanced throttle, increasing throttle and finally maximum throttle. The most important points are when you ease of the brakes and get back on the throttle, where all movements must be silky smooth and progressive. As mentioned, this diagram is overly simple and I rarely drive such a boring corner—except at Yas Marina. Oftentimes, you’ll be driving a few corners in a row that affect each other in turn. The racing line here is much more complex and too detailed for the purposes of this article—again, if you require more advice on track day, read our in-depth article on racing lines or speak to an instructor. Braking is important for obvious reasons! We have a detailed tutorial on braking that you can watch here. The biggest issue with beginners’ braking is usually that the pressure is not consistent through the braking zone; they usually brake lightly and then ramp up the pressure as they get closer to the corner. From the moment you press the brake pedal to when you being to release the brakes, your pressure should be consistent. If you do not want to give your brakes a really hard time, then don’t use them at 100% of their capacity, but keep the pressure consistent and adjust your braking point accordingly. In the bigger deceleration zones, where you’ll be downshifting more than one gear, I recommend using a reference point. A reference point can be, amongst other things, a change in the asphalt, the start of an entry curb, a sponsors’ banner on the barrier, or a braking distance sign for the corner itself. It doesn’t matter what it is, just that it won’t move lap-to-lap or session-to-session (so don’t use a shadow as one of my clients once tried)! Using a reference point means you know exactly where you braked on the previous lap and, if you feel comfortable to, you can brake a little later on the next. It’s just important that you’re conscious of where you’re braking and how close to the limit you feel. At the end of the braking zone, it’s important that you release the brakes smoothly or as an instructor might tell you, “bleed” off the brakes, and remember to do this in a straight line. If you release brake pressure too quickly, or once you’ve started steering, you’ll unbalance the car. 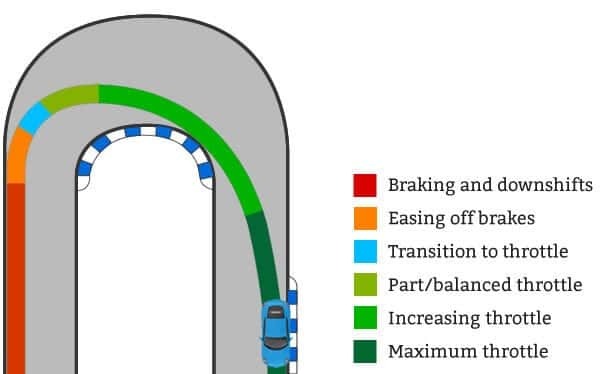 For future reference, there’s an advanced technique called “trail braking” that enables drivers to use more of the available grip, this is not something to try on your first day or your fifth, but you can find the trail braking article here. Once you’ve got the braking done, and the car is at the correct speed for the approaching corner, the next thing to think about is your steering and line into the curve. As mentioned already, before you turn, your vision should already be at the apex, so you’ll have a good idea of where you’re heading. It is very important that, as you turn the car into the corner, you do so in a smooth and controlled style. As with much of driving quickly, the best technique is calm and smooth, rather than aggressive and jerky. So, turn the car smoothly into the apex, gently loading up the outside tyres with an increasing steering angle until you have the correct trajectory and can clip the apex. Once you’ve reached the apex, you should already be looking towards the exit—once again, this will help you gauge the best racing line for corner exit. As with turning into the corner, your turn out should be silky smooth and precise, using all of the road that’s available. I’ve already repeated this a few times with regard to braking and steering; however, being smooth is possibly the most important aspect of applying the throttle. It does depend on how powerful your car is, and how much grip it has, but it is always the best practice to be as smooth as possible. Your car’s tyres only have a certain amount of grip; if this grip is being used completely by cornering (lateral forces), there’s no room for acceleration (longitudinal forces). So, before you can begin accelerating out of a corner, you must begin to reduce the steering angle. The simplest way to think about this is to imagine that there is a piece of string from the position of your left hand on the steering wheel to the top of the accelerator pedal. Now imagine you have 90 degrees of steering angle, you’re off the throttle pedal completely, and the string is taut. In order to accelerate, you must release the tension on the string, which is possible only when you reduce the steering angle. This means that as you open up the steering more, you can accelerate more. This concept continues proportionally until the steering is completely straight and it’s possible to use 100% of the throttle. If you have a manual car, gear changing on track can be tricky. Changing up the gears isn’t too difficult; the changes should be fast, but not rushed. If you’re driving a car with a “normal,” synchro-mesh gearbox, you will have to take your time changing gears, as it’s physically impossible to change really quickly. Downshifting is where things get more difficult. Initially, especially when you first head out on track, simply make sure you reduce speed enough before you shift down a gear. If you downshift too early, you run the risk of over-revving and blowing your engine. Once you have more experience on circuit, you can try the more advanced technique of “heel-and-toe.” This is where, while braking and downshifting, you match the engine RPMs to the wheel speed. For example, if your speed is 80 mph when decelerating and changing from 5th to 4th, the engine must have higher RPMs in 4th than in 5th. To match the RPMs, the driver taps the throttle with his heel, and continues to brake with the toes between the gear changes. You’ll hear many people in the paddock talking about understeer and oversteer; they’re basic principles to understand when trying to find your limits and those of your car. You can find detailed video tutorials on understeer and oversteer on Driver 61. Both handling characteristics are understood in their literal form: understeer is when the car doesn’t turn enough, and oversteer is when the car turns too much—both involve a loss of grip at either end of the car. When your car has understeer, you’ll feel the steering go light as the front tyres slide across the circuit, squealing as they go. I have written another article on understeer, in which I explain thoroughly what it is, and more importantly, how to change your driving technique to reduce it. Oversteer can be caused by braking and turning at the same time as you enter a corner, or pressing the throttle too harshly on exit, causing wheel-spin and reduced traction. If you feel the rear of the car sliding, it’s important to react quickly, applying opposite lock (sometimes known as counter-steering) to stop the car from spinning. You’ll hear F1 drivers talking about a well—or more likely a not-so-well—balanced car. A well-balanced car is one in which neither end slides prominently before the other, which is the holy grail for racing drivers—you may also know this as a four-wheel drift. So, the theory is all very well, but how fast can you go around each corner? Well, that is the joy of driving on track days: finding out your car’s limit around each corner and maximising the speed you carry through it. It’s a difficult challenge. Carrying the maximum speed through each part of the corner does not come easily—you certainly won’t grasp the technique perfectly on your first track day. With seat time, experience, and hopefully some coaching, you will edge closer and closer to the perfect technique. On your first day, I recommend (as I have done many times already) that you take it easy and build up your speed gradually. The truth is that if you’ve not been on track before, you just don’t know how much grip there is and how much speed you can carry through a certain corner. If you build your speed gradually, you will reduce your chances of an accident significantly. For example, if the maximum speed you can take through a corner is 50 mph, you may start at a conservative 20% lower than this, i.e., 40 mph. You shouldn’t try to increase your speed so quickly, but in this example, if you increased your speed by 1 mph through the corner each lap, even when you exceed the limit you’ll only do it by 1 mph—which means you’ll be able to adjust and prevent spinning your car. However, if you’re pushing too hard and increasing your speed by 4 or 5 mph each lap, the chances are you’ll be going much too fast through the corner and lose control. As with everything I’ve said, be smooth, build up speed gradually, and if you need more advice, please speak to an instructor. On a final note, I’d like to mention that it’s the easiest thing in the world to spend the day thrashing around the circuit, unconsciously driving in the same, almost out-of-control, manner. Many drivers go too hard too soon; these people may be relatively quick in the morning, but they stay at the same (low) level all day. The drivers who do a better job are the ones who start slow, build up their speed, and by early afternoon, they’re quicker, safer, and more consistent than their over-confident counterparts. These drivers will improve with time and eventually become good track drivers—and perhaps even racers.